There are 4 ways to find issues. 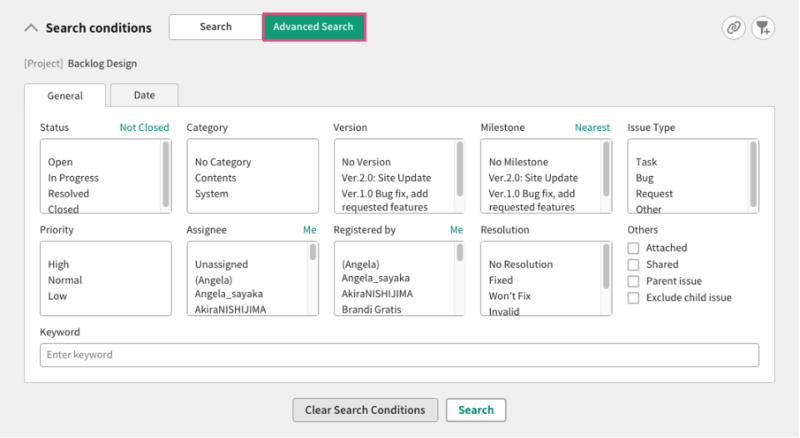 When you access the “Issues” tab of the Project, you will see the search results of the Simple Search. You can change the search conditions by changing the "Status", "Category", "Milestone", “Assignee” and “Keyword” on the top of the page. When you want to narrow the search result, please click the "Advanced Search" link. You'll be able to filter with more conditions. Multiple conditions can be selected at once to use multiple search filters. Search by Keyword is possible both on the simple and advanced search. The Search box for "Search by Keywords" is always on the header. If you are involved in multiple Projects and need to find issues across them, you can use use the search bar on the top panel or Find Issues on the Dashboard.